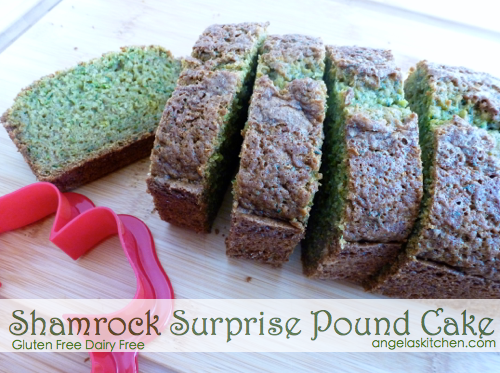 I used my gluten free dairy free zucchini bread for the shamrock center and a lemon version of my pound cake for the outer cake. Love! I got the smallest zucchini I could to increase the green flecks in the batter and minimize the need for coloring because that is how I roll. However, it wasn’t quite enough green for me, so I did end up adding a bit of green coloring to boost the color a bit. You can get gluten free, dairy free, natural food colorings from India Tree’s line called Nature’s Colors. The shamrock cutter I have turned out to be too large for my zucchini bread, so I ended up using scissors to cut the shapes out. This turned out to be much easier than it sounds, trust me. 🙂 My biggest tip for this step is to be sure your zucchini bread is COMPLETELY cooled before slicing for the cleanest cuts possible. I also recommend freezing the thick slices for 20 minutes before using your shamrock cutter, again for cleaner clear shamrock slices (ya know, if your shamrock is the right size. I would use a cutter not any larger than 3″). 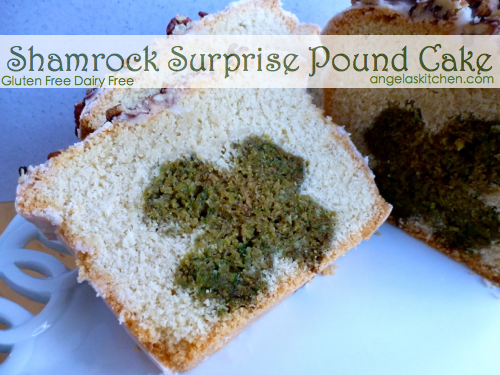 Pop the shamrock shapes back into the freezer while you mix up the pound cake batter. 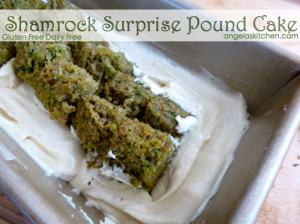 The firmer zucchini bread will be easier to work with if firm. There you go, my take on the peek-a-boo surprise pound cake concept, done gluten and dairy free. Enjoy! 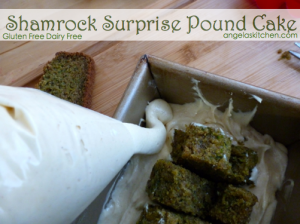 Bake the zucchini bread: Cream together sugar and oil. Beat in eggs. Mix in zucchini. Combine dry ingredients well and add to sugar mixture. Mix with large spoon or mixer until well blended. Add and mix in green coloring, if needed. Pour into an oiled 8"x4" loaf pan. Bake at 350 degrees F for 45-55 minutes or toothpick inserted in center comes out clean. (The time needed to bake will depend on how wet your zucchini is.) Allow to cool completely. Slice ends off of bread, then slice zucchini bread into thick slices. 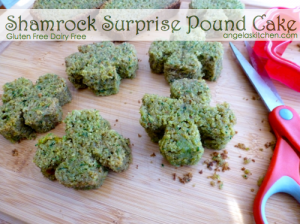 Freeze on a lined baking tray for 20 minutes, then cut shamrock shapes from bread. 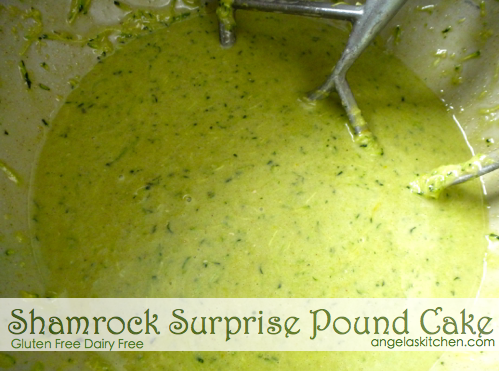 Pop shamrocks back into freezer while making pound cake. To make pound cake: Preheat oven to 325°F. Grease an 8"x4” bread pan and set aside. In a large mixer with a paddle attachment, cream together the margarine, oil and sugar on high speed for three minutes. While margarine is creaming, whisk together the gluten free flours and starches, baking powder, xanthan gum, and salt. After your three minutes is up, add eggs, one at a time, whipping for a full minute after each egg added, scraping down the sides of the bowl and the paddle as needed. Once the eggs are fully incorporated, add the dry ingredients and mix in until incorporated. Scrape down mixer and whip for three minutes. Scrape batter into a freezer bag. Snip corner of bag and use to pipe pound cake batter. Put 1/4 of the batter into the greased pan. Set shamrock shapes next to each other up and down (see above photo) then set into the batter. Pipe remaining batter around and ontop of shamrock shapes. 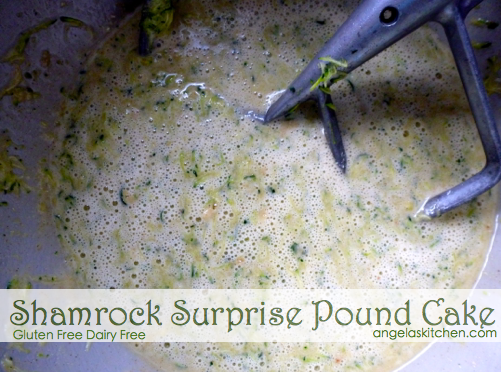 Smooth batter being sure to completely cover shamrocks. Bake cake at 325°F for 50-60 minutes or when a cake tester inserted into the middle comes out clean. After removing from oven, allow to sit for 5 minutes, then remove cake from pan and allow to cool on a cooling rack. After cake is cooled, mix together glaze ingredients. Pour glaze over cake. Top with nuts, if using, while glaze is still wet. Allow glaze to set before slicing.